Tonight on the CW my favorite show THE VAMPIRE DIARIES airs with a whole new episode called “We’ll Always Have Bourbon Street.” On tonight’s show when Stefan confronts Damon with a suspicion about Elena, Damon has no choice but to help Stefan investigate. Did you see last week’s premiere episode? We did and we recapped it here for you. On last week’s show Caroline did her best to be there for Stefan and Elena in a tough time. Damon tried to convince Stefan to help him uncover Prof. Shane’s motives, but Stefan was intent on carrying out a different plan with Klaus. At the annual Miss Mystic Falls Pageant, Elena and Caroline gave April advice on which dress to wear, while Tyler and Hayley worked together on a secret project, and Damon confronted Prof. Shane with his suspicions. Alarmed by the vivid nightmares he was having, Jeremy turned to Matt for help, but the situation escalateed sooner than anyone expected. On tonight’s show A FLASHBACK TO NEW ORLEANS IN 1942 – When Stefan confronts Damon with a suspicion about Elena, Damon has no choice but to help Stefan investigate. Searching for answers, Damon and Stefan visit modern day New Orleans to see if they can find anyone who remembers the events of their last visit in 1942, including one of Damon’s former flames, Charlotte (guest star Madeline Zima). Elena, Caroline and Bonnie share a girls’ night while the Salvatore brothers are out of town, and emotions run high when Elena delivers some shocking news. At Hayley’s (guest star Phoebe Tonkin) urging, Tyler confronts one of Klaus’ hybrids, Kimberly (guest star Alyssa Diaz), and the situation quickly escalates into violence. Finally, Damon is faced with a heartbreaking decision. Jesse Warn directed the episode written by Charlie Charbonneau & Jose Molina. The Vampire Diaries Season 4 episode 8 ‘We’ll Always Have Bourbon Street’ airs at 8PM tonight on the CW and we will be live blogging it will all the up-to-the-minutes. So come back to this spot and spend the evening with us enjoying the show! Make sure to refresh often to get the most current update! Tonight’s recap: Tonight’s show opens up with Damon in bed alone, Elena is already up. She hops back in bed with Damon for more hanky panky. Damon tells her he is happy. Caroline thinks it is a disaster because she has figured out that Elena is sired to Damon. Stefan thinks it may not be so bad because it is very rare. Caroline wants to do something, she is going to speak to Tyler. Stefan asks her not to talk to anyone else about it. Tyler and Hailey are trying to break Aiden’s bond. Aiden is Klaus right hand and he is the last to break the bond. Kim tells them they are hurting Aiden and he should have free choice. Kim releases Aiden and they leave. Elena tells Damon that Stefan should know. Damon wants to enjoy one secret day before they tells Stefan. He asks Elena for just one day, he gets her to agree! As Elena is leaving, Stefan shows up. Stefan tells Damon they have to talk. Damon does not believe what Stefan has to say about Elena being sired by him. Damon thinks Stefan is just jealous. Stefan wants Damon to test Elena to prove his point. Damon finally agrees. Elena comes into school and Bonnie asks her if she is okay with having to move out. Elena asks Bonnie and Caroline if they want a girls night. They agree! Damon and Elena are in a classroom and Damon gives her a bag of blood and he asks her to try it for him (he is testing whether she is sired to him and whether he can convince her to do something) Caroline drinks the blood and tells Damon that it tastes good. Elena is happy she does not have to hurt people anymore. Shane comes in and Hailey is there and she tells Shane that she is having trouble breaking the last hybrid. Shane tells Hailey they already have the 12, they have Tyler. She tells him Tyler is off limits. He tells Hailey if she wants the memory stick with the information on her parents he better get her the 12 unsired werewolf’s. Caroline calls Stefan and tells him he found out about sire bonds. The werewolf sire bonds to Klaus are because the wolfs are grateful they do not have to turn all the time. But, it is not the same for vampires. Stefan comes into the house and Damon tells him that Elena is sired. Stefan asks what he is doing, Damon is looking for a solution. He is looking to New Orleans in 1942 and a girl who use to be crazy about him, Charlotte. In a flashback we see Charlotte and Damon in 1942 New Orleans, Damon gets up and tells Charlotte to watch his drink and don’t let anyone spill it. Damon gets up and a man spills Damon’s drink. Charlotte breaks his neck. Damon comes over and asks her what she did, she tells him she was hurting the man for spilling his drink as he requested. Current time Damon tells Stefan that was the first person he was sired too and he had to break the sire. Stefan wants to know how he did it and Damon tells him a witch. Damon and Stefan are going back to 1942. Caroline, Bonnie and Elena are having a girls night and Elena tells the girls, thanks to Damon she can now drink blood from blood bags rather than people. Bonnie tells the girls he has stoner tea to open their Chi. Shane is helping her with her magic. Caroline tells the girls she will not be judgmental even if she thinks Bonnie and Elena are potentially ruining their lives. 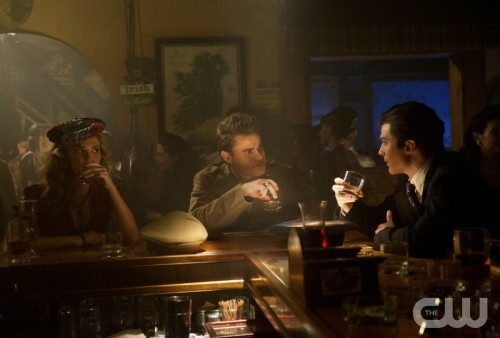 Stefan and Damon are back in 1942. Stefan is pissed because Elena is sired to Damon – he tells Damon he cannot believe that Elena does not see how wrong Damon is for her. Back in 1942 Stefan and Lexie are practicing how Stefan can make nice to Damon. Stefan goes over and taps Damon on his shoulder. Damon pretends not to know him, then asks him if he has come to put a stake in his heart. Stefan tells him he has come to bury the hatchet. They embrace. Stefan tells Damon he is going to Egypt to serve in the army. Stefan leaves to get drinks and Lexie tells Damon he is not following Stefan to the army. Charlotte come over and brings a dead girl bleeding and tells Damon she brought a girl to share with him. Damon is shocked. Back in current time Stefan asks Damon where he thinks Charlotte is. Damon tells Stefan that he told Charlotte to count every brick on every building in New Orleans and he would meet her. Damon left the next morning. He doubts after 70 years Charlotte is still counting. Hailey tells Tyler that they have to break the sire bond and Tyler has to put Kim in her place. Tyler goes over to Kim and Aiden and tells them that they need to break the bond. Kim challenges him and Tyler fights back and orders her to bring Aiden to the stables to start breaking the bond again. Tyler leaves with Hailey. Kim tells Aiden they are going to pick a fight. Meanwhile Damon accuses Stefan that the only reason he wants to break Elena’s sire bond is to change her back to the original factory settings. Damon leaves and someone jumps on him and kisses him. It is Charlotte she tells Damon she knew he would come back to him. She counted every brick on every building in New Orleans. Charlotte is all over Damon and he tells her he needs her help to find someone. Meanwhile, Caroline, Elena and Bonnie have been doing a lot of drinking of Dom Pérignon and they are pretty drunk. Caroline makes a nasty crack atefan and bout Damon and that he is a man whore. Elena comes clean and tells the girls she slept with Damon and she is happy and she wanted to let her best friends know, they are shocked. Damon and Stefan comes into a shop and Damon tells her he is looking for a witch called Val. Val had a grimoir and she could break a vampire sire. They found out that they need 12 humans as sacrifices. The girl tells him Val was her grandmother and all her spells and Grimoirs were lost in Hurricane Katrina. Elena tells Caroline and Bonnie that they have to leave. Elena tells the girls she is falling in love with Damon. Caroline gets mad and tells Elena she is sired to Damon. Caroline tells her to ask Stefan and Elena gets pissed off and tells them to leave. The girls head to the door and Kim and Aiden show up and start fighting with them. Bonnie uses magic to stop them but Kim threatens to bite one of them and kill them. They leave and take Caroline with them. Damon tells Stefan that the witch is lying. Stefan does not want to kill 12 humans. Damon says he would do it for Elena. Elena and Tyler are trying to find Kim and Aiden in the woods, they hear Caroline scream. Tyler tells Elena a sire spell changes how a person acts, not how they feel. Damon goes back to the witch’s shop. Damon tells her he know she is not the witch’s granddaughter, she is her daughter. The daughter tells Damon that her grandmother lied to him the 12 human sacrifices will not break a bond, she lied to Damon to get power. The witch tells Damon and Stefan a vampire sire is created when a human has feeling for a vampire before she turns into a vampire. The only way to break the bond is for Damon to cast her away and leave her. Tyler runs in the barn and Kim is hurting Caroline. Tyler tells her to stop Caroline is on their team. Kim tells him Caroline is on Tyler’s team not hers. Kim threatens to stake Caroline, Elena tells her if she wants to hurt Klaus she should hurt her. Kim gets up and goes after Elena. Tyler jumps on her and stakes Kim and demands she submit to Tyler or she die. Kim submits to him, all the other werewolfs submit to Tyler too. Tyler is not the alpha wolf. Charlotte is upset because Damon is leaving. Damon tells Charlotte to forget about him and never think about him again. Charlotte tells him she cannot forget him. Damon tells her she won’t have the life she deserves if he is in it. He bids her goodbye. Damon comes to Stefan and tells him he set Charlotte free. Stefan does not think Damon will be able to set Elena free. Damon tells him he will find out one day he does not know him as much as he thinks. Back in 1942, Lexie tells Damon he is not going overseas with Stefan. Lexie knows Damon killed 12 innocent people. Lexie thinks Stefan will turn to Damon for guidance and will become a ripper again. Damon tells Lexie he just needs his little brother. Lexie tells him it might be good for Damon, but it would destroy Stefan and Damon needs to let him go. Damon agrees. Current time Stefan tells Damon he did not know about it. Stefan tells Damon that after it is all over if Elena does not feel the same way about Stefan that is okay because it is Elena’s choice. Caroline hugs Elena and tells her she is sorry and a jerk and she promises to never be a jerk again. Elena gets Caroline to promise not to tell Stefan about Elena and Damon. Elena tells Bonnie Shane is really helping her with her magic. Hailey comes to see Shane she tells him 12 sire bonds have been broken. She wants to know where her parents are. Shane tells her they are dead. She is pissed, he tells her just because they are dead does not mean she cannot see them. Shane tells her this is just beginning. Stefan tells Caroline how Damon will have to break the sire bond. Stefan assures Caroline that Damon will do what he has to do because he cannot be selfish with Elena anymore because he loves her. Damon comes into the house and they both agree the night was awful. Elena tells Damon she knows she is sired to him, Caroline told her. She asks if there is a way to break it. Elena tells Damon that Tyler told her it only affects how she acts, not how she feels. Damon tells her he wants her to love him like he loves her. Elena begs him not to do what she know he is going to do. Damon tells her he has to do what is right by her. It is not because he is a good person, it is because it is what Elena needs him to do. Elena touches his face and asks him if it feels wrong. Keep refreshing, we are live blogging.